M.A. Dennis speaking on the steps of the Legislative Office Building. Housing is a human right because there is no LIFE in the shelter system; Bounce, Shorty, Mustafa, Khan, Jimmy, the new Spanish guy on the third floor, Juan, and the anonymous body bag I saw them throw inside the Medical Examiner's van, those are all of the individuals that died around me while I was homeless. Housing is a human right because there is no LIBERTY in the shelter system. Do you have any idea how dehumanizing it is to have a 79-cents bag of peanut M&Ms that you purchased on sale from Duane Reade with your last dollar, confiscated by the security guard at the shelter's entrance checkpoint? Just about every place in New York has Wi-Fi because they know everyone has a cellphone, tablet, or laptop; yet, shelters make you feel like a second-class citizen by denying you the liberty to possess the electronic devices one needs to stay connected to family, work and society. Preparing for the march to the Legislative Office Building. 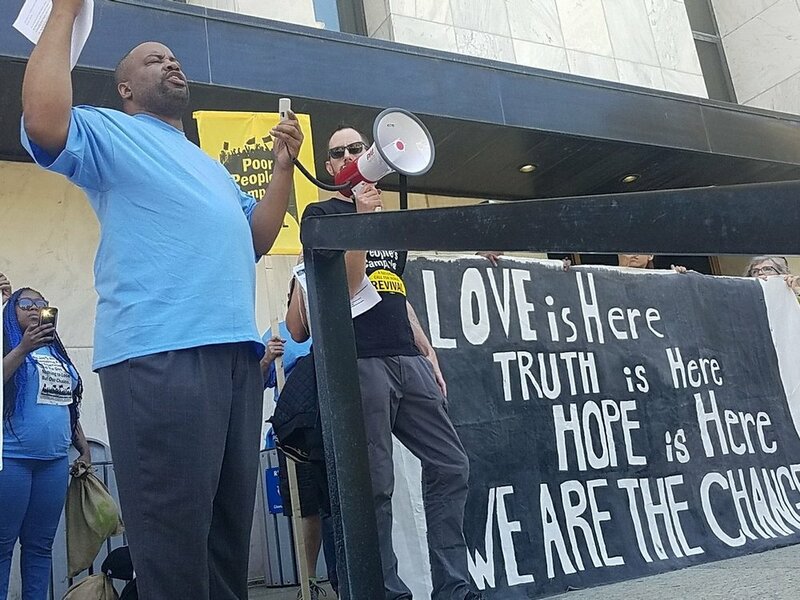 Housing is a human right because there is no HAPPINESS in the homeless shelter or on the streets. There's nothing happy about seeing feces, dirty needles or worse on the floor almost everyday. There's nothing happy about playing Food Poisoning Roulette each time you take a chance on visiting the cafeteria. There's nothing happy about having your underwear stolen, before you got a chance to wash them. There's nothing happy about a guy coming into my room and threatening me with a razor blade because I didn't give him 50-cents for a cup of coffee. And that's why I'm so happy to now be living in my own apartment thanks to a rental assistance program voucher provided by NYC, and the social service organizations that advocate for landlords to take these vouchers. I want the others, left behind and still suffering in homeless shelters, to also attain this happiness. Because again, there is no happiness, nor liberty nor life, in being homeless.